A person’s home is the one place that they should feel the safest. However, very few people select their home based upon its defensive characteristics. Regardless, there are things that we can do to make our home more resistant to burglaries and home invasions. We can begin by examining every external door and window to make sure that they can be securely locked. New locks should be purchased if the existing locks are not strong. However, fancy locks on an unlocked door or window don’t really do much good. So the next step is to get into the habit of keeping them locked, even when we are at home. The best lock won’t keep someone from breaking in our door, but it will take time and cause them to have to make a lot of noise to get it done. We can make use of that time and notice to protect ourselves and our family. Very few people take the time to wander through their own home and study it from a defensive standpoint. It is a great idea to take a few minutes and study each room to determine where the best cover is. We want to locate the best places in each room that provide us with the best defensive advantage. 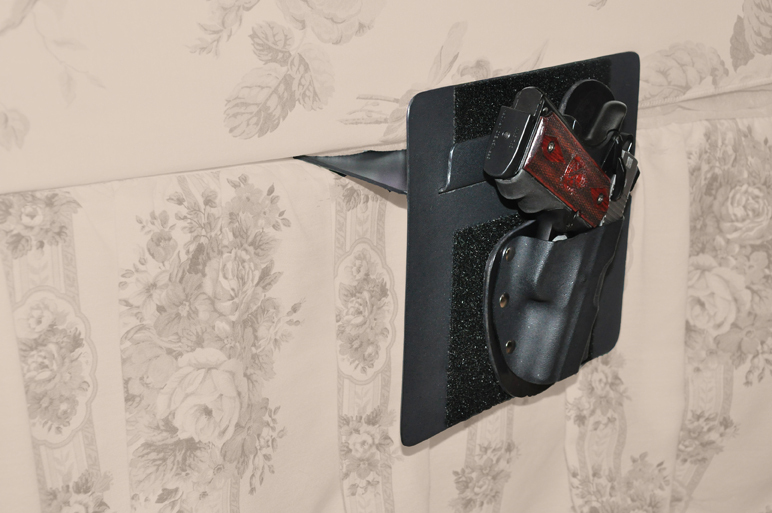 We should even consider moving furniture so that it provides either cover or concealment that we can use to our advantage. Is our favorite easy chair situated so that you can see the door into the room, or even see outside through a nearby window? Nearly every home has at least one blind corner in it. Might this be a good place to hang a decorative mirror so that it is no longer a blind corner? We should also study each room in the home to determine the best place to locate a defensive firearm. And, at the same time, we should find ways to conceal those firearms so that they are not readily available to unauthorized persons. Especially if there are children in the home it is also important to make sure that those firearms are secure from youthful curiosity. What type of gun safe do you use? How long will it take you to access a firearm from within that safe? Have you actually timed yourself? Dwelling places and families are all different. And no one can do a better job of studying the defensive characteristics of your home than you can. Changing locks, moving furniture and installing mirrors are not terribly expensive or time-consuming. But they are all things that can strengthen your home and give you more of an advantage during a criminal attack. If you look up to find yourself looking down the barrel of a criminal’s gun, you have lost the battle before it has even begun. On the other hand, if you are aware of a threat before your house has even been breached, have taken cover, and alerted 9-1-1, you have won the battle before the crooks have even had time to react. No one knows your home better than you do. Take a little bit of time and make that work for your defensive benefit. This post appeared originally in Shooting Illustrated. This entry was posted in Personal Defense, Projects and tagged combat mindset, home defense, shooting illustrated. Bookmark the permalink.